Black locust trees, Robinia pseudoacacia or false Acacia, are abundant in our Sierra Foothills. The trees were probably brought here by the Europeans in the mining days. On my recent trip to Southern California, I discovered them in my old stomping grounds in Topanga! They are a fast growing hardwood. They were traditionally used for bow making. They have a short showy bloom phase in late spring for about two weeks. Their legume-like vanilla-scented blossoms are edible! They taste like sweet pea flowers, nutty with a sweet hint of the nectar inside. You can snack on them like popcorn, or sprinkle them as a garnish on top of a light bowl of cattail soup (see Living Wild book for recipe). See this guide for tips on identifying black locust trees. 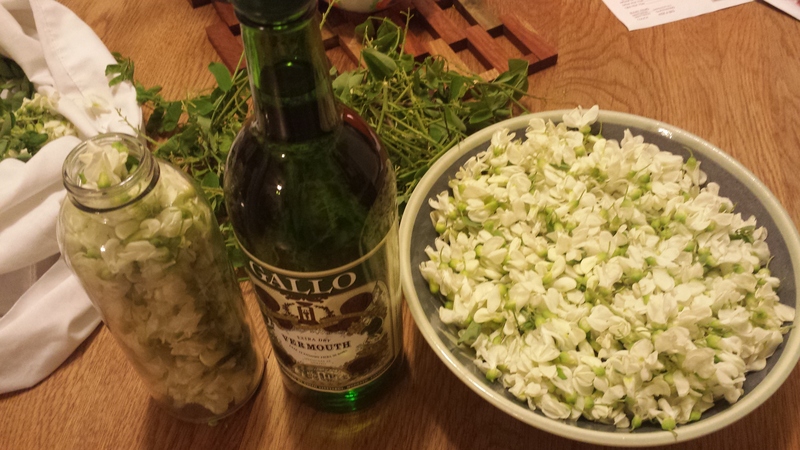 My latest concoction is a black locust blossom vermouth. It lends a sweet floral pea flavor to the mild lemony taste of dry vermouth. It is a warm spring or summer sipping, low-alcohol beverage. It is nice to use clear bottles so you can see the blossoms soaking. I like to use old GT Kombucha bottles, labels removed. Simply gather your blossoms and pluck them off of their stems. Stuff a bottle until it is nearly full of blossoms. Then pour vermouth to the top. Label your bottle and let sit for 3-6 weeks. Strain, saving some of the blossoms to garnish. The drink is lovely over a bit of ice. Locust Blossom vermouth is a delightful way to preserve the tastes of spring to share with friends. My favorite food to make for dear friends who are recovering from any major life transition is gello! I spell it with a “g” because it is different than our childhood treat. It is made with grass fed gelatin (available at HAALo) and because you can create your own amazing flavors as wild as your imagination can get. I am very into using seasonal medicinal plants in my food. 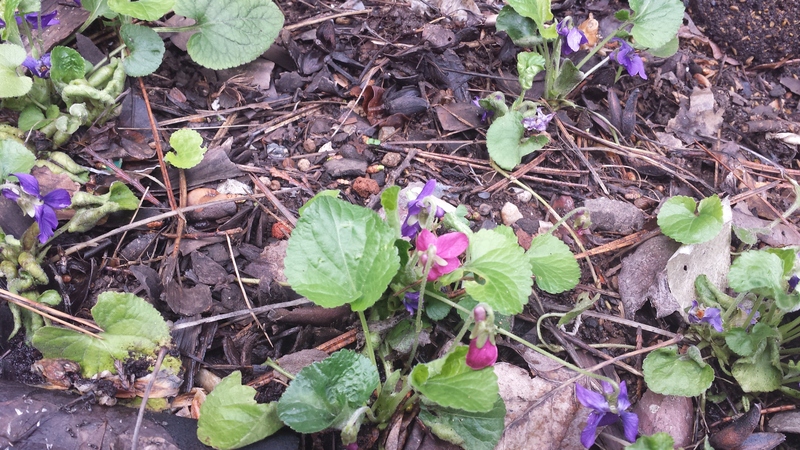 In this blooming spring, the violets are out, in three colors, purple, fuschia(!) and white. 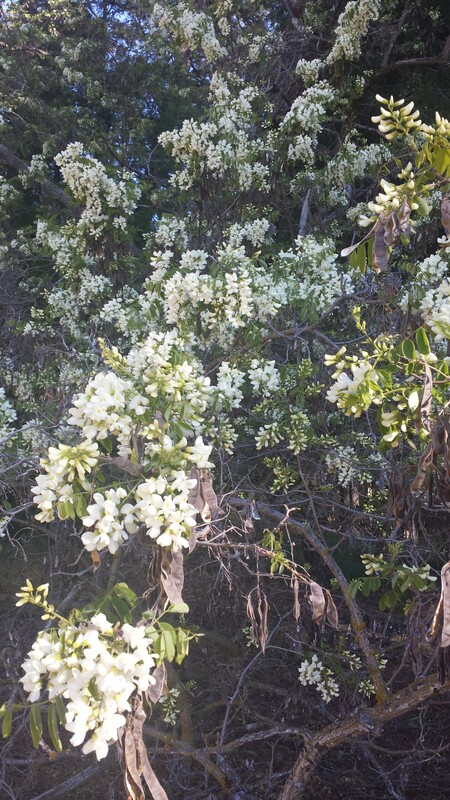 They are everywhere around town on people’s lawns, roadside, wafting their sweet fragrance within a several feet distance from where they bloom. They impart their odor as flavor to all sorts of delicacies. I have two dear friends who are recovering, Megan from childbirth and Shea from major back surgery. They both need the same types of foods! Nutrient dense, easy to digest potent foods. So I have been feeding them gello. Violets have been used traditionally to decrease inflammation and help one sleep. Perfect for these two dear lady friends! They are called “zi hua di ding” translating to “purple flower ground spike.” They clear heat toxins, nourish blood, and regenerate flesh. 1 c heavy whipping cream (raw, or pasteurized, but NOT ultrapasteurized if you can help it). Alternately you can use coconut cream, it is just not as subtle. Add 1/2 c cold water and let it dissolve. Meanwhile pour cream into a saucepan on low, immerse your violets in the cream. Do not let it boil. When warm almost hot, add honey and stir til it dissolves. Again honey is to taste. Add hot water to dissolved gelatin in a mold, stir to make sure it all does dissolve. 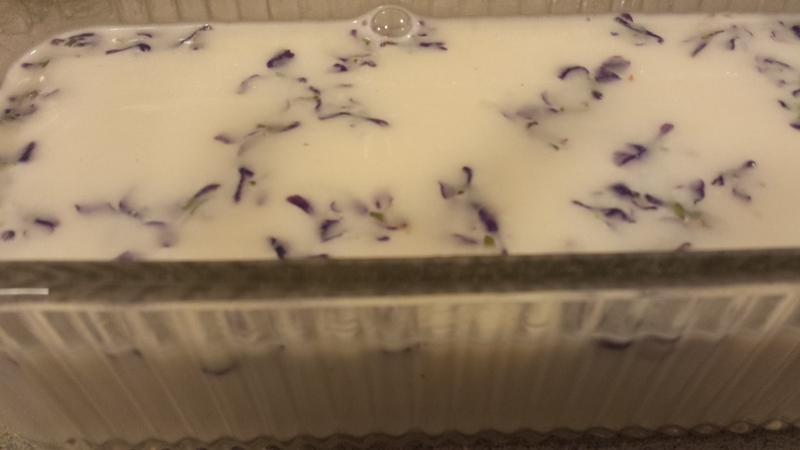 Then add your violet cream to your mold. Stir. Make sure your violets are nicely arranged on top. Chill. The cream will separate creating a two-toned gelatine. Slice and eat with your fingers, or serve in quaint little bowls. Eat as much as you want. 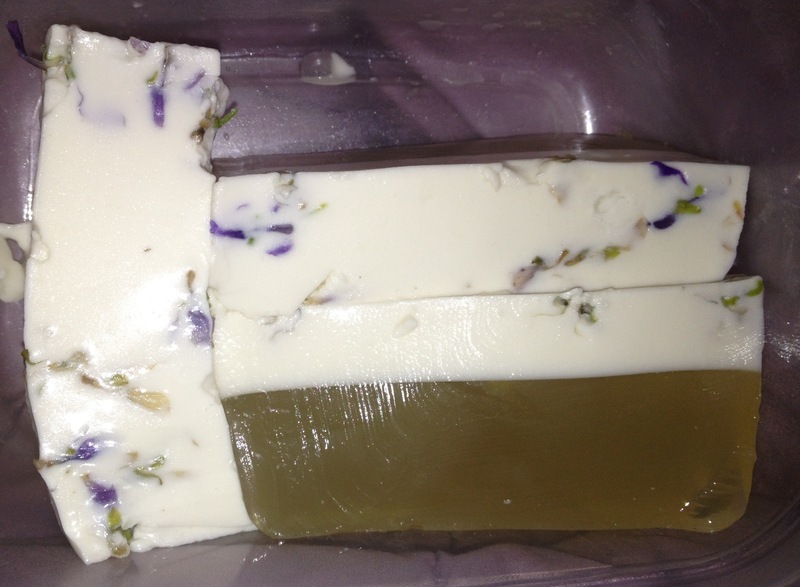 It is lovely subtle, gentle, nourishing heart blooming healing food. Enjoy. WILD CALIFORNIAN ROSE HIPS, A.K.A. JIN YING ZI: A Native Local and Traditional Chinese Plant Food Medicine! Ah, the rose. Though most cherished for its intoxicating heart nourishing and heart opening (and heart qi moving) essential oil, few realize the potent healing properties contained in its fruit, hips, or haws as some call them. Many of you are familiar with rose hips for tea, but have you had them as FOOD? Yes, food! There are accounts of it being eaten with salt and butter! 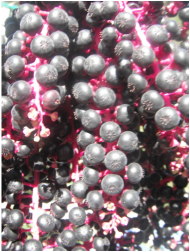 Native American people have used this fruit in stews, soups, teas, and raw as snacks, to support their health through local available foods. When I see rose hips while hiking and foraging, my kids and I enjoy snacking on the softer hips for they are sweeter. The rosacea family has fed and healed us with over 3400 plants: apples, apricots, peaches, cherries, pears, plums, blackberry, raspberry, hawthorn, agrimony, cinquefoil, and mountain ash, to name a few. Many of these plants were brought in by settlers as they came to new lands, because the plants were so valued for food and medicine. Just when all plants have withered and dropped their energy deep down into the earth into their roots, out pops the rose hip, containing 5x the vitamin C contained in oranges. Up here in the Sierras where citrus is rare, may Rose Hips be our C of choice! During World War II, the whole of England turned to rosehips for their vitamin C during a crippling citrus shortage. All rose hips are edible, but most abundant right now is the Wild California Rose Hip. Most recent research and use has been in effectively alleviating pain and stiffness in the knees, hips, and other joints, associated with osteoarthritis. Its anti-inflammatory properties are attributed to its ability to reduce the C-Reactin protein (CRP) and creatinine, inflammation markers. Lower CRP levels are also associated with heart health and decreased triglycerides. It is rich in vitamin C, tocotrienols, beta carotene, pectin and many other health enhancing ingredients that protect against cancer and cardiovascular disease. Rosehips are considered one of the most important Chinese health tonics. They are highly valued by the Chinese, both as a food and as medicine. Rose hips are sour, astringent, and neutral; they go to the Bladder, Kidney, and Large Intestine. It stabilizes the Kidneys and retains Jing, which is our primordial essence, or battery juice if you will. If the Kidneys are weak, our lower gates will not be strong enough to contain our essence. We can lose Jing through excessive vaginal discharge, seminal emissions, and night time urination. Jin Ying Zi also functions on the Intestines, part of the lower gates. It binds the Intestines to stop chronic diarrhea from spleen deficiency. For most of these functions Jin Ying Zi will be combined with other herbs. This herb is contraindicated in cases with excessive fire or fever, or excessive pathogenic factors (cold/flu/virus) and is better as an immune tonic. Long-term use may result in constipation. Pick after the first frost, as the hips are softer and come off easier. Before I begin picking, I check in with the plant, asking if I may use its fruit to make medicine for my family and community. Then I talk and sing to the plant, whatever song comes out, whatever else I wish to share in that moment with the plant. It is also a common courtesy to return to the plant just for a visit, to share with it how your concoction came out, who you shared it with, how its medicine worked. Mince 1lb of rosehips in a blender, and empty straight into 3 cups of boiling water. It is important to put the hips in the boiling water immediately after mincing to minimize the loss of vitamin C. Stop heating and let stand for 15 minutes. Filter the mixture through a jelly bag. Put the mixture remaining in the bag back in the saucepan, add 3/4 pint of boiling water. Allow to stand for 10 minutes and then filter through the jelly bag again. It is important to remove all the hairs that cover the seeds as these will be an irritant if swallowed. The recipe suggested re-filtering the first cupful of juice to make sure all the hairs are removed. I add equal parts raw honey to the syrup and a bit of alcohol, about a 1/4cup, as a preservative. Even with these ingredients, it may ferment slightly, but it will definitely have a longer life. The fermentation can contribute to the medicine! Refrigerate. It may gel up, due to the high pectin content. Use it as a jelly! In Europe, traditionally a tablespoon a day was given in the winter months to the whole family. You will be able to find a Sierra Berry Elixir with locally harvested rose hips at HAALo!